In true serial cliffhanger form, the story picks up from the previous issue with a car that our heroine commandeered from some thugs going over a cliff and spinning down a hill. All turns out well, as Veronica Prescott is awakened from a bad dream by a radio show. I don’t recall if the entire introductory chapter was supposed to have appeared in the previous issue or all in this issue. 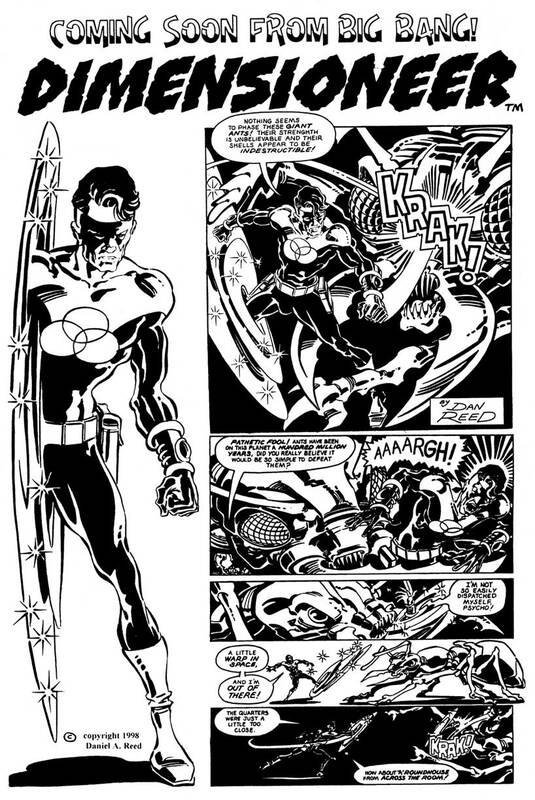 Either way, I’m guessing that the lost Bill Fugate Thunder Girl story left us a few pages short in BB #16 and creator Jerry Acerno graciously let us split the intro. 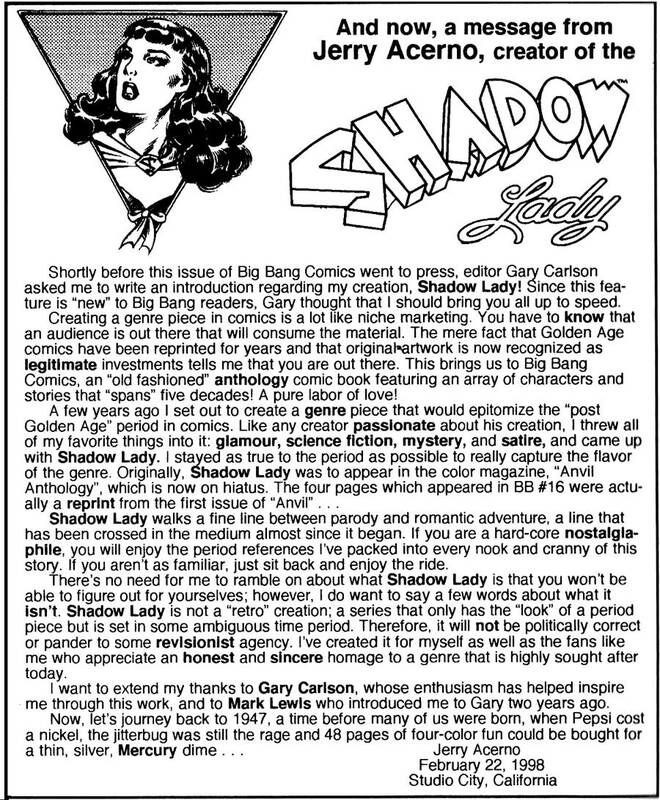 Speaking of Jerry, he wrote an introductory piece about Shadow Lady that ran on the inside front cover to Big Bang #17. Rather than paraphrase it, I’ll just reprint it here. Please take the time to read and enjoy his thoughts. Regardless, the Shadow Lady story continues at radio station WXKZ where they were broadcasting the live episode of Feeble McDweeb, which had been playing on Shadow Lady’s radio. Unfortunately, she had turned off her radio before the lead actor dies onstage before the live audience. The next morning, beautiful scientist Veronica Prescott is working in her father, Professor Aloysius Prescott’s laboratory, assisting him to perfect his latest invention, an Inviso-Ray Projector. Things don’t go well and her father stalks off, but Veronica agrees to a date with fellow assistant Hank for the following night. As she prepares for the date, Veronica reads about the mysterious death of Feeble McDweeb while soaking in the bathtub and listening to the radio. As she reads, one of the stars of Tubbins And Nubbins dies laughing on the radio and Veronica decides that the Shadow Lady had better investigate these strange deaths, leaving poor Hank without a date. She heads for radio station WXKZ where we witness the Program Director auditioning a beautiful foreign singer for a job, before his own shadow moves across the floor and merges with the Shadow Lady’s. And that’s where Chapter 1 of “Murder By Microphone” ends, to be continued in Big Bang Comics # 21 (and concluded in #26). Jerry’s art is gorgeous throughout, with plenty of cheesecake posing to keep the pages turning themselves. 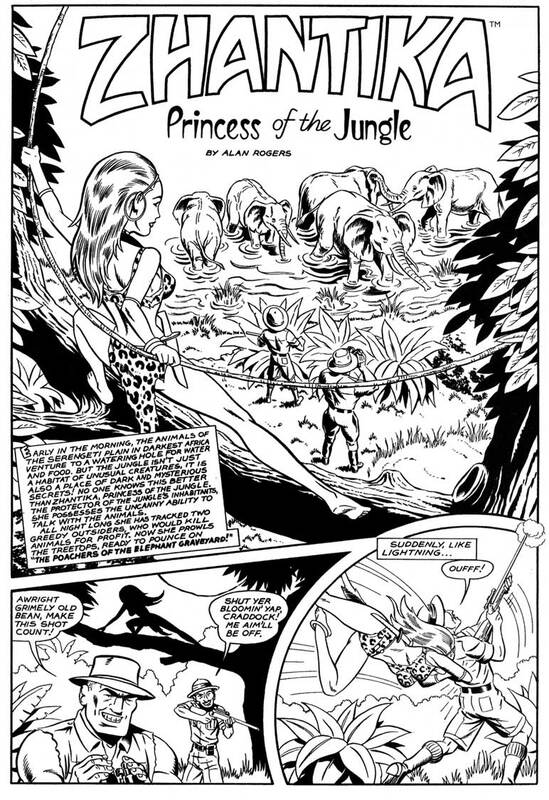 Our second story stars Zhantika, Princess of the Jungle in “The Poachers of the Elephant Graveyard.” Written by Lyle Dodd, penciled by Mark Lewis and inked by David Zimmermann, both the story and the heroine are a thing of beauty. The tale begins with Zhantika ambushing two poachers who are planning to kill some elephants for their tusks. The hunters escape in their jeep, but our princess follows on the back of an elephant, while using the powers of her mystic knife to trail them by seeing through the eyes of a leopard. Zhantika follows them to a legendary elephant graveyard, where despite hundred’s of tusks on the ground, the poachers set their sights on a pair of black tusks atop a black obelisk. Despite Zhantika’s warning, they remove the black tusks, releasing an ancient evil being from its prison. Luckily, the Princess of the Jungle is up to the task of defeating the poachers and returning the giant monster to his prison. 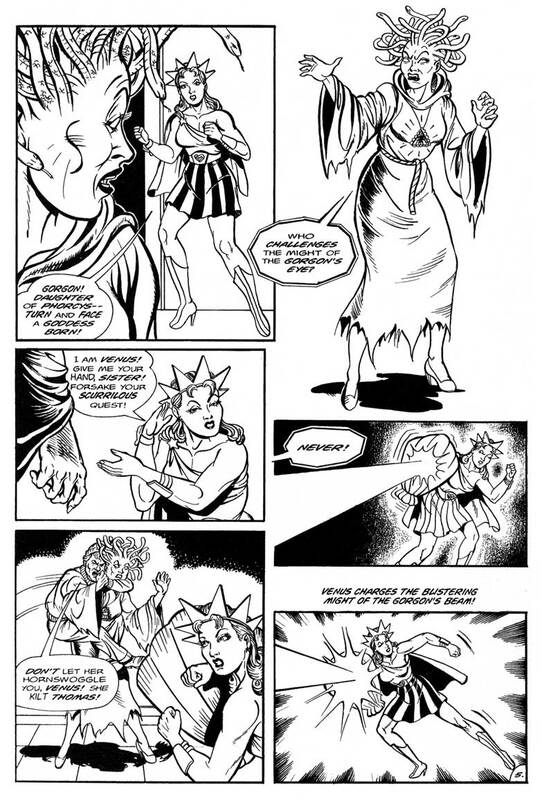 The third and final story in this issue stars Big Bang veteran Venus, the Goddess of Love & Laughter in “Eye of the Gorgon.” Written by BB co-creator Edward DeGeorge, the story opens with a man and woman at the Museum of Sciences, viewing a statue of a Gorgon wearing a jeweled necklace. Mesmerized, the woman puts on the amulet, transforming herself into Medusa, complete with a head full of snakes and begins turning all the guards and her boyfriend to stone. The police call upon Venus for help, who arrives with her two besotted boyfriend sidekicks Thomas and Mick. A quick history lesson about Medusa and Perseus follows, after which Thomas is caught unaware by the Gorgon and turned to stone. 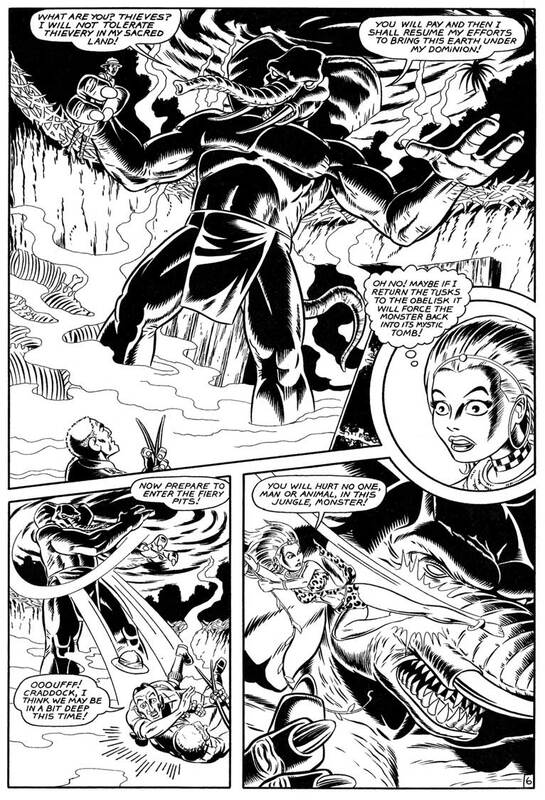 Venus faces off against Medusa, who is stopped when Mick, angry that she hurt his friend, jumps on the Gorgon’s back and rips loose the amulet. The Gorgon reverts to her human self, but the men are all still trapped as stone statues so Venus rides her winged horse Pegasus to the Homeland of the Gods for some berries of a sacred Juniper bush that can reverse the Gorgon’s spell. While plucking the magic berries, Venus is attacked by a Chimera that destroys the bush. She returns to Earth and restores all but one of the stone men – – the boyfriend of the woman who had been bewitched. Luckily, the woman’s tears prove to be more powerful than the Gorgon’s Curse and the lovers are reunited. Tony Manginelli did an outstanding job penciling the story and capturing the look and feel of the Wonder Woman stories of that era, aided and abetted by the inks and letters of Shawn Van Briesen and his studio partner CHAS. That completes the stories in the issue, but the four pages of ads remaining are just as much fun to me. 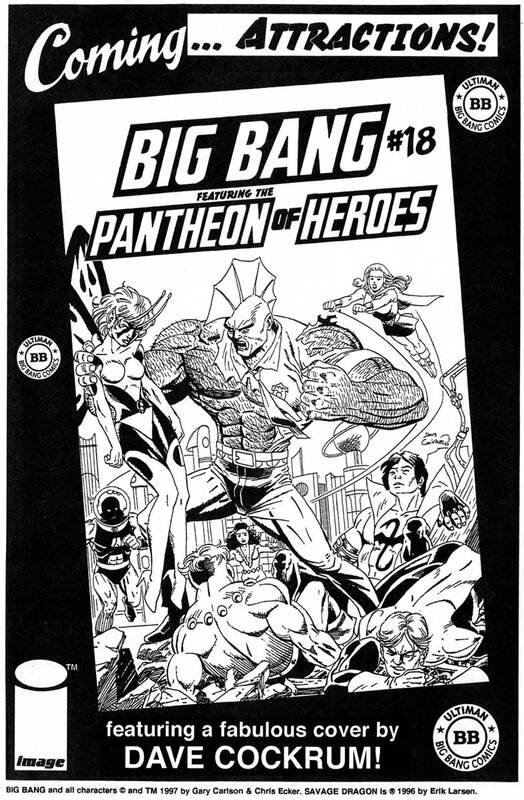 First up is an ad for the next issue, Big Bang #18 containing the third and final part of the storyline starring Erik Larsen’s Savage Dragon. The cover is by one of my favorite artists ever – Dave Cockrum and it just had to co-feature the Pantheon Of Heroes, Big Bang’s homage to the Legion of Super-Heroes, one of my favorite series, especially Cockrum’s run on it. 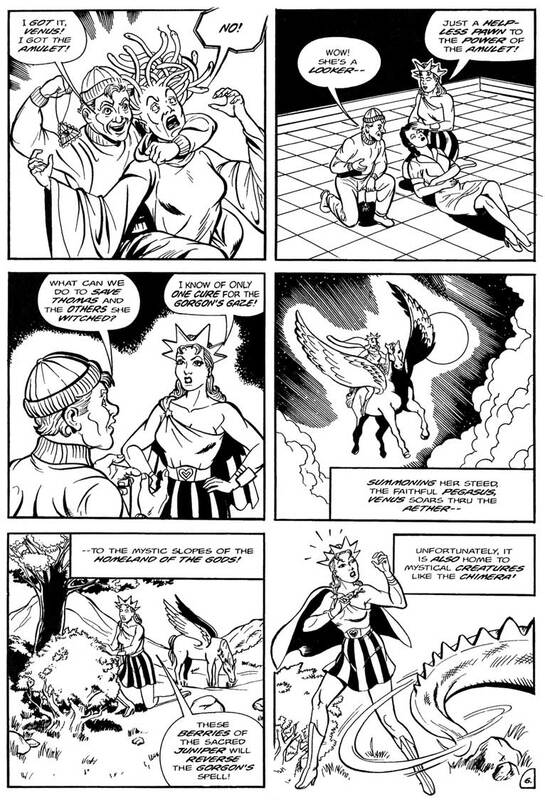 Then came a one page preview of my pal Dan Reed’s Dimensioneer strip, soon to appear in BB #s 20, 21, and 22. Dan was on hand with me way back in 1982 with my debut in Megaton #1. He was back in some of the earlier issues of Big Bang and then started on his own creation, which he has been perfecting over the years. For tons more on Dan’s Dimensioneer (and even some of my old Nero comic strips) check out Dan’s great website at http://dimensioneer.com. 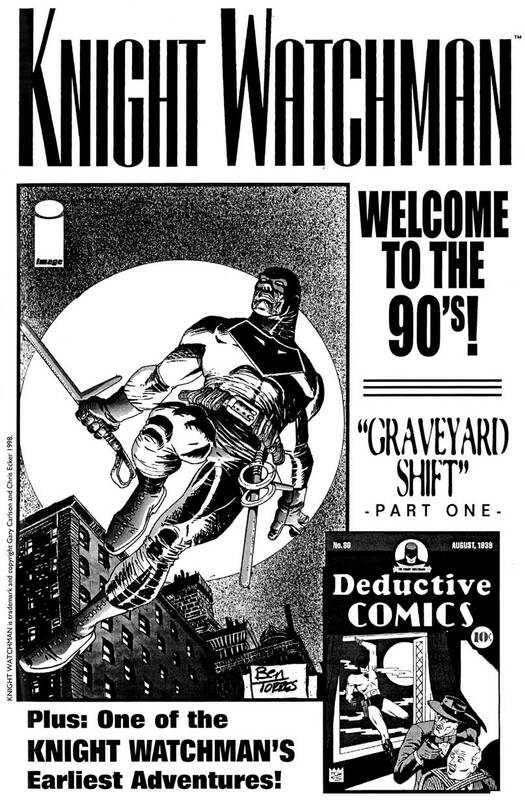 The inside back cover of BB #17 featured an ad for Knight Watchman: Graveyard Shift #1 which would be coming soon from our publisher, Image Comics. It features a fantastic cover by Ben Torres, who has gone on to draw Daredevil and Kingpin at Marvel Comics, and equally fun stuff for Mort Todd and Roger McKenzie at the Charlton Arrow. 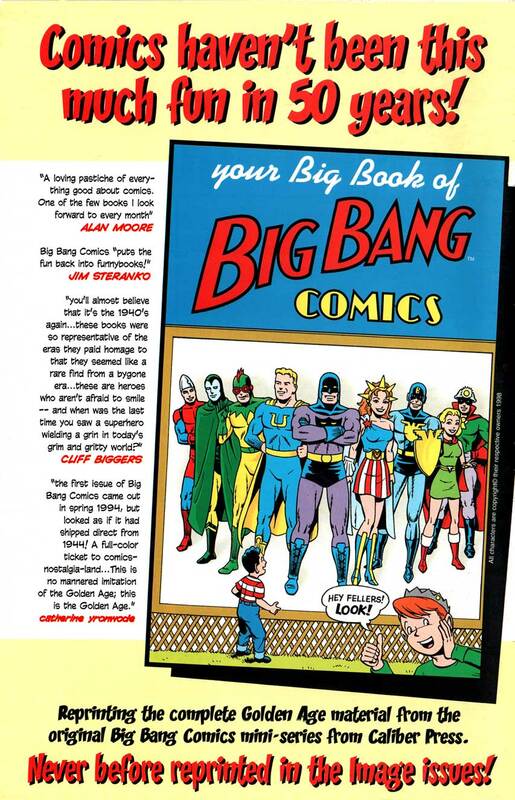 Last but certainly not least, the outside back cover of the issue was an ad for “Your Big Book of Big Bang Comics,” a trade paperback collecting the three issues of Golden Age material from issue #s 0, 1 and 2 originally published by Caliber Press. 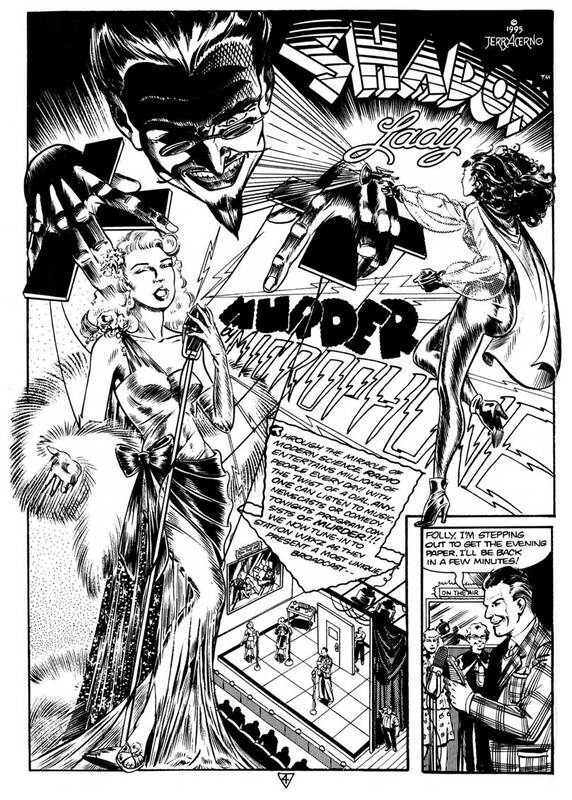 The ad featured the fantastic cover by Mark Lewis, as well as positive blurbs and quotes from no less than Alan Moore, Jim Steranko, Cliff Biggers and cat yronwode. Ah – – the good old days. See you next time. Big Bang Comics, Venus, Knight Watchman and all related characters are © and TM Gary S. Carlson and Chris Ecker. Savage Dragon is © and TM Erik Larsen. Shadow Lady is © and TM Jerry Acerno. Zhantika is © and TM Lyle Dodd and Mark Lewis. The Dimensioneer is © and TM Daniel Reed.